This intense split focuses on isolating your upper body one day. It's simple, yet intense. Get ready to drip with sweat and get shredded! The Upper / Lower Split program is a two day split program designed to work your entire body to its full potential. The first day, the upper day, includes both compound and isolated workouts targeted at your back, biceps, triceps, and shoulders. It’s a little bit of everything as to tire your muscles out, but not give you too much fatigue on any one muscle. It’s great for toning and building muscle. The lower day, is focused on everything from the waist down. 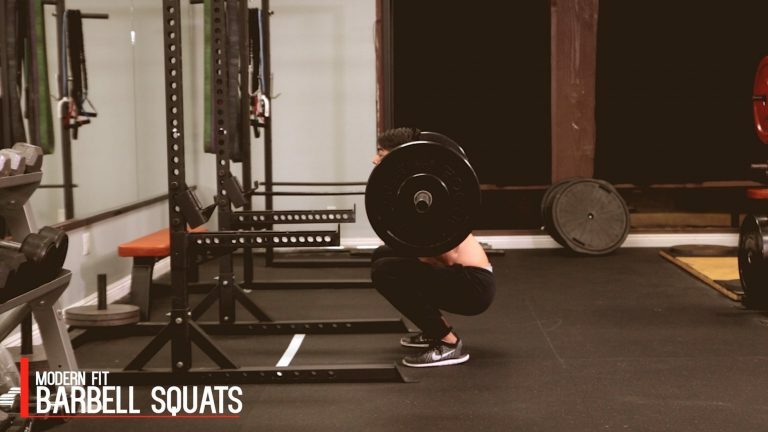 There are both strengthening movements like leg presses and squats as well as compound movements such as lunges and fire hydrants that will stretch your muscles out, hitting angles you might not have hit before. After doing the upper and lower day, take 1 – 2 days of rest before repeating. 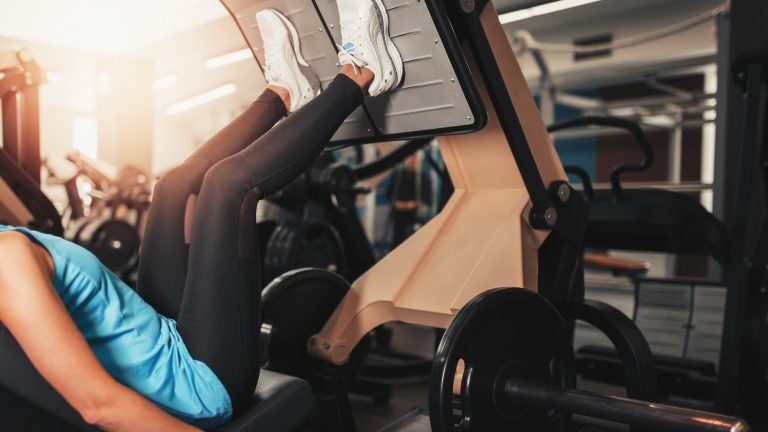 If it’s your first time working out, or trying this split take 2 – 3 days off before doing any heavy lifting for recovery. Also consider doing one of our ab workouts or cardio on the rest days to finish off your week strong! Start by picking two dumbbells that will allow you to complete the desired number of reps. Sit on a utility or military press bench that will give you back support and place both dumbbells on your thoughts. Grip the dumbbells with your palms facing each other. Use your thighs to kick the weights up to shoulder height on either side. Your wrists should be rotated so that the palm of your hands are facing forward. Exhale while pushing (“pressing”) the dumbbells up until your arms are almost fully extended and the two flat sides of the dumbbell touch. 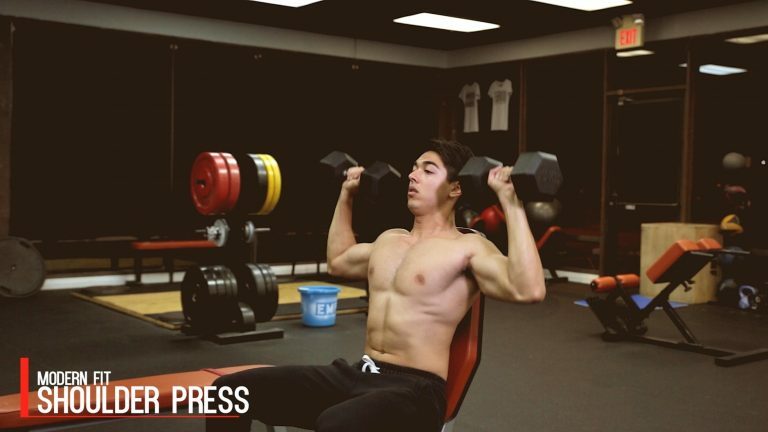 Pause, then inhale while moving the weights back down to shoulder height. Once you’re done with your set, rotate and lower the dumbbells back onto your thighs to prevent injury. There are a few variations to this exercise based on the equipment that you have. Some gyms have pulley systems set up with seated rows that have a flat bench with a place for your feet, others don’t. Start by attaching a V bar to the lower or mid to lower setting of the pulley. If you’re on a fixed seated row machine that has a place for your feet you can simply leave the pulley as is. If there is no seated pulley row machine, bring a seated bench about 2-3 feet from the cable machine. Sit with your feet planted against the feet pads or firmly planted. Hold the V Bar firmly in front of you with your arms extended, but relatively straight. Lean back slightly while keeping your torso straight. Pull the V bar towards your chest, while trying to keep your elbows close to your body. You should feel your back muscles contracting towards each other. Exhale through the movement. Pause for a moment then slowly release the weight back to the starting position. Inhale through the movement. Repeat for your desired number of reps.
Start by picking two dumbbells that you can do the desired number of reps with. 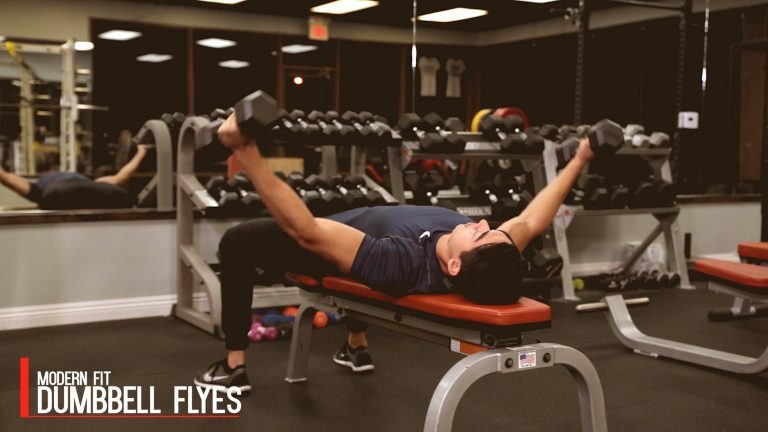 Lay down on a flat bench with the two dumbbells on your thighs. 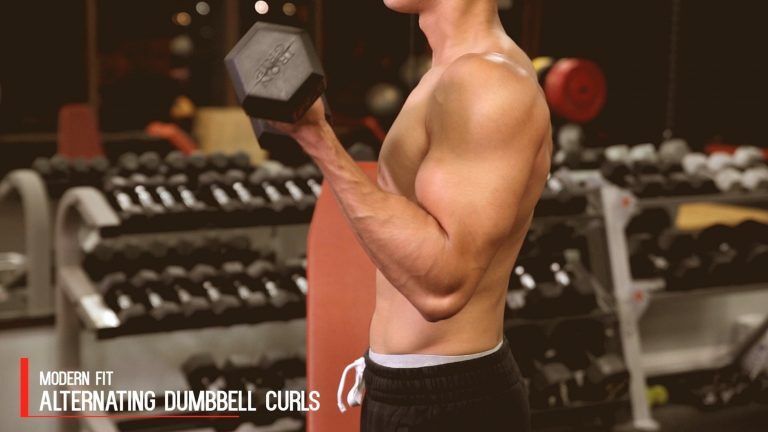 You should be gripping the dumbbells with your palms facing inwards. Raise the dumbbells over your head with your knuckles facing upwards like you’re punching the ceiling, but don’t lock your elbows. Rotate the dumbbells so your palms are again facing each other. Bend your elbows slowly and slowly bring each arm down to your side as to create a T with your body. With your elbows still slightly bent bring the dumbbells back to the center completing one rep. 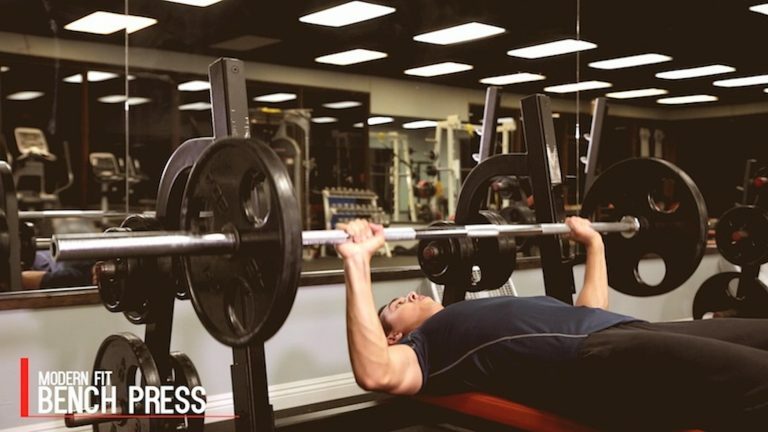 Tips: Squeeze your chest together through each rep for maximum effectiveness. Keep your arms relatively stationary and push through your shoulders to bring the weights together during each movement. Lie back on a flat bench. With a medium width grip (a grip that produces a 90-degree angle in the center of the motion between the forearms and the upper arms), lift the bar from the rack and hold it straight above you together with your arms locked. This is your place. From this position, as you inhale and slowly come down until the bar touches your middle chest. After a brief pause, push the bar back to the starting place while breathing out. 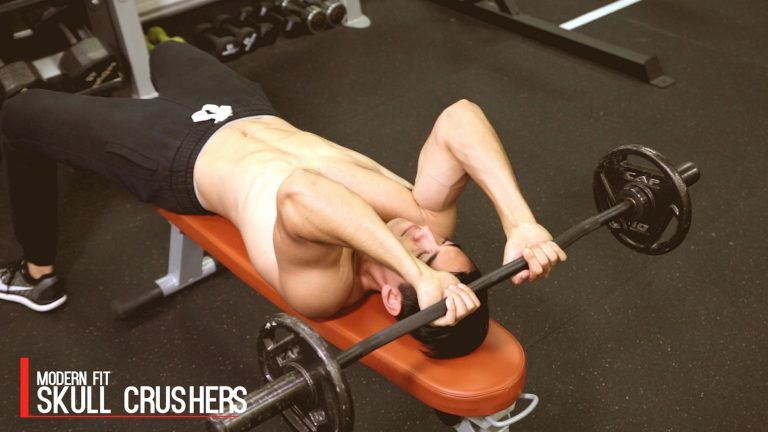 Concentrate on pushing on the bar using your chest muscle. Squeeze your chest at the peak position of the movement, hold for a second and then begin coming down slowly. Tip: Ideally, lowering the weight should take about twice as long as raising it. Repeat the movement for the amount of repetitions. When you’re done, set the bar back in the rack. If you’re new at this Exercise, it’s recommended that you use a spotter. Also, be conservative with the amount of weight if you don’t have a spotter. Don’t bounce the weight off your chest. You should be in fully control of the barbell at all times. Stand upright with a dumbbell in each hand held at arms-length. The elbows should be close to the torso. The palms of your hands should be facing your torso. This is will be the starting position. While holding the upper arm stationary, curl the weight forward as you breathe out while contracting the biceps. Complete the movement until your bicep is fully contracted and the dumbbell is at shoulder level. Hold this contracted position for a second as you squeeze the bicep. Tip: During this exercise, the forearms should only move. Slowly bring back the dumbbell to the starting position. Repeat this movement with the other hand. This equals one repetition. Continue alternating hands for the recommended amount of repetitions. Variations: There are Lots of Variations for this movement. As an example, you can do this exercise sitting down on a bench with or without back-support and you can also perform it by doing both arms at the same time. Stand upright with a dumbbell in each hand held at arms length. The elbows should be close to the body and the palms of the hand should be facing your thighs. 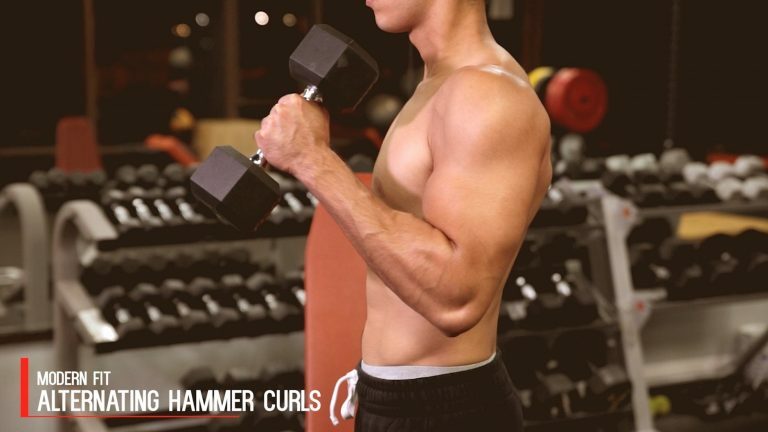 While holding the upper arm stationary, curl the right dumbbell as you rotate the palm of your hand until they are facing forward. At this stage continue contracting the biceps as you exhale until your bicep is fully contracted and the dumbbell is at shoulder level. As you squeeze the biceps hold this position for a second. Tip: During this exercise, the forearms should only move. As you breathe in, slowly bring the dumbbell back to its original position. Tip: Remember to twist the palms back to the original position as you come down. Repeat this movement with the opposite hand. This equals one repetition.